When you think of a vacation to Germany, what comes to mind? Perhaps it 's visiting fairytale castles and medieval towns. Perhaps it 's seeing the Bavarian Alps and beautiful countryside. Perhaps it 's savoring German food and beer. 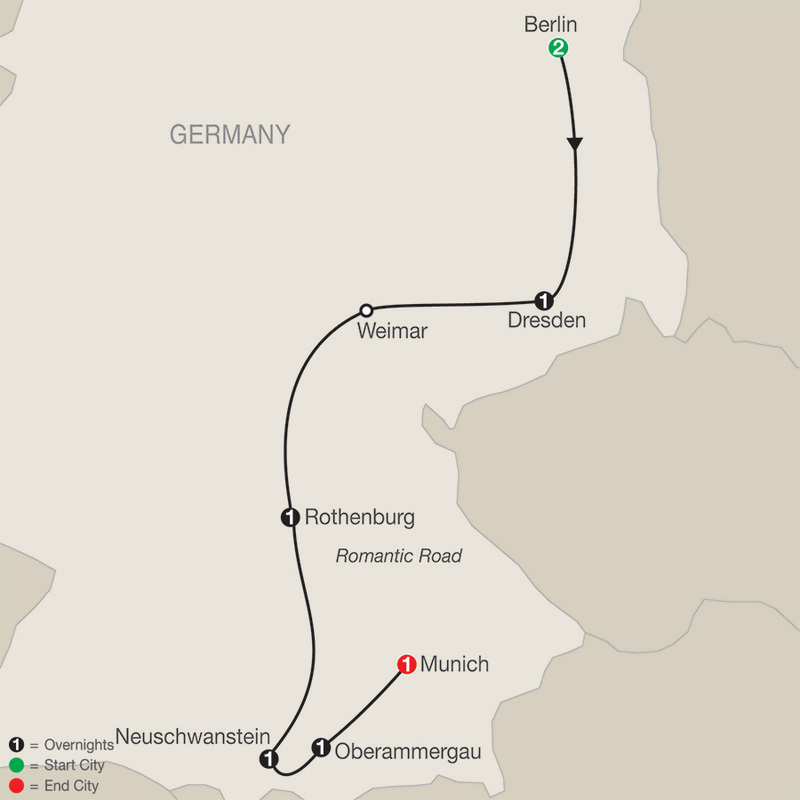 If so, all of this and more are included on this marvelous Germany tour from Berlin to Munich. Sightseeing in each city includes the must-see sights. In Berlin, you 'll visit Kaiser Wilhelm Memorial Church, badly damaged during the war and today a symbol of reconciliation. During your walking tour in Dresden, visit the courtyard of Zwinger Palace, one of Germany 's best-known baroque buildings. In Munich, visit the lively Marienplatz. Here, observe the famous glockenspiel, which re-creates a 16th-century wedding. You 'll also visit Weimar, where you 'll enjoy a pleasant walk through the town. Highlights of this Germany tour are a drive along the Romantic Road past small villages to visit Neuschwanstein Castle, King Ludwig II 's fairytale castle nestled in the beautiful Bavarian Alps. You 'll even stay in a charming hotel beautifully located between Neuschwanstein Castle and Hohenschwangau Castle, the family home of King Ludwig. Another unique experience Globus has included on this Germany tour is an overnight in medieval Rothenburg with its ramparts and towers, cobblestone lanes, and 16th-century houses. In the charming village of Oberammergau, see the world-famous Passion Play, performed every 10 years by Oberammergau residents. With the majestic alpine scenery in the background, it 's a once-in-a-lifetime experience. Of course, no vacation to Germany is complete without experiencing a lively Biergarten, and Globus has included a farewell dinner at one in Munich. Throughout this Germany tour, you 'll be accompanied by a Tour Director who knows the ins and outs of Germany—its history, secrets, culture, and language. All you have to do is sit back, relax, and enjoy this fantastic Germany tour!